The Ministry of Defense of Armenia (MOD) made public on Wednesday the names of the people shown on YouTube, showing an Armenian army officer beating, torturing and humiliating two conscripts. The defense ministry says that Major Sasun Galstyan, who “under the influence of alcohol beat and teased servicemen,” is the culprit who abused sergeant Garik Harutyunyan and private Bakur Yeghikyan. Galstyan is accused of abuse of power and is now in custody. According to ArmeniaNow sources, the conscript who shot the video is under pressure by the military for his role in showing the material. 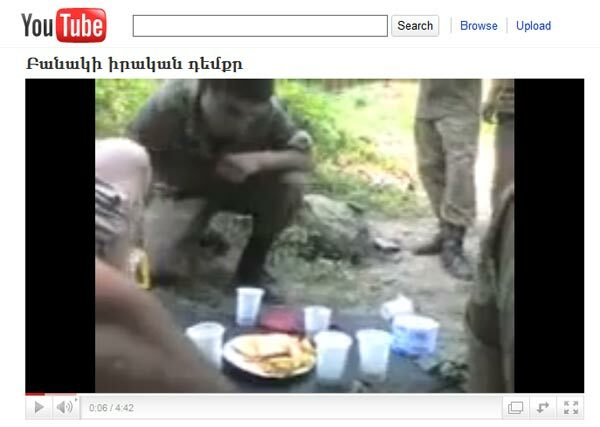 “It turns out that the conscript who shot the video is pressured more than the ‘cannibal’ [meaning officer Galstyan], who humiliates soldiers,” one of the relatives of the conscript, who shot the video, told ArmeniaNow, preferring to be anonymous.